When I got to highway 100 at the south end of the new trail through the Lake Butler private tract, I began to follow an old abandoned railroad right-of-way. Some of it has been developed into paved greenway, some remains unpaved and 'primitive'--better for hikers. Some is overgrown and not yet developed, and some is closed because the old trestles are torn down and/or unsafe. The Florida Trail follows it all. I started with an overgrown part - seven miles between Clark Saw Shop Road and the town of Lake Butler. The right of way follows beside the highway through this stretch, and I hiked a few short bits of it, but most of it was an impenetrable tangle. Where the track crossed Swift Creek there is an old trestle that is still sturdy enough that I hiked across it. Most of the time I was hiking the shoulder of FL 100, and there I passed an old fire tower in a patch of Florida Forest Service property. Next I hiked the four miles of paved greenway through and south of the town of Lake Butler. I met a few bikers out enjoying this quiet trail (photo up top). Most of it is well away from roads and homes and development, though it does pass a big noisy timber processing plant. Flowers continue to bloom here in northeast Florida on the climatologically coldest day of the year. The final section I hiked today was a five mile road walk around a long, high trestle that I'm told was rotting and falling apart nineteen years ago when legendary Eastern Continental Trail pioneer 'Nimblewill Nomad' hiked across it. It is now closed. 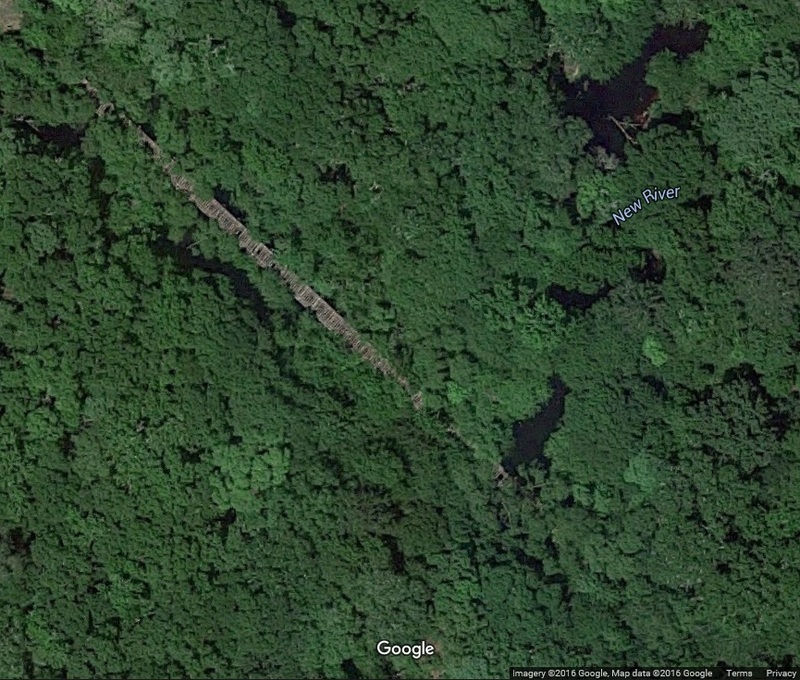 The Google Satellite image shows that it is still there, but I didn't hike in to check, and I certainly wasn't going to risk a crossing of such a high, dangerous structure. And so I did the road walk and crossed the New River on the Highway 100 bridge. The shoulders were narrow and the truck traffic incessant. I hope they can resurrect the railroad bridge sooner rather than later. 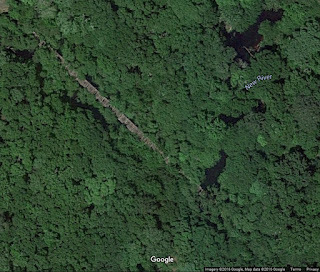 Tomorrow I hike unpaved trail that looks a lot like the above shot of the closed section.